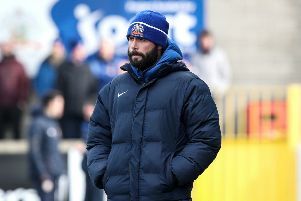 Coleraine man Roger Woodend is one of a number of Northern Ireland fans to feature on Colin Murray’s radio show on Talk Sport this Thursday morning. Roger, who helped form the New York NISC, brought along his tailormade NI suit jacket, which he and his good friends wore for the Championship opener against Poland on Sunday. He will be hoping for a better result in tonight’s crucial encounter with the Ukraine! Colin Muraay admiring Roger's famous Green and White Army suit jacket.